I don’t know why I ever thought that the production of toothpaste was something complicated and best left to the professionals. Maybe it’s the fact that I had never used any toothpaste before that was not bought in a shop. Or maybe because there is something vaguely ‘medical’ about using toothpaste. Perhaps I am just scared that I’ll lose my teeth prematurely if I use the wrong stuff. Yet, when it comes to natural cures I am all for home remedies and have total faith in nature. In any case, since the vast majority of toothpaste on the market is sold in plastic tubes with plastic lids, I started researching the obvious alternative: making my own. There are literally hundreds of recipes and advice on the internet for making tooth powders and tooth paste. 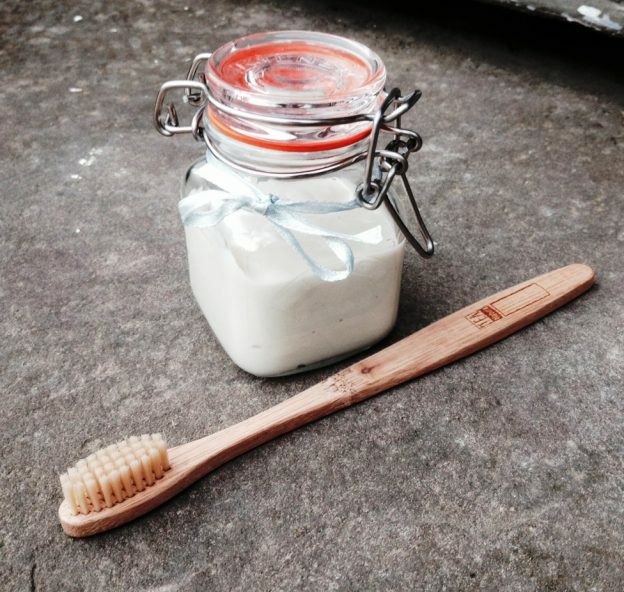 After trying a couple of different recipes I now make this wonderfully refreshing toothpaste with bicarbonate of soda, china clay and essential oils such as peppermint, clove and fennel. Both, bicarbonate of soda and clay are ingredients that are used in common toothpastes found in shops. Essential oils add freshness and flavour and have all sorts of benefits for teeth and gums. I make smallish batches at a time which last our family for a few weeks and only take 2 minutes to prepare. This is currently my absolute favourite toothpaste recipe. I have given some to friends and we’ve taken it on holiday in small cosmetic or Kilner spice jars. Brushing my teeth with my own healthy and natural toothpaste and bamboo toothbrush makes me very happy in the mornings and reminds me to keep flying the flag for plastic free living throughout the day. Joy! This entry was posted in Bathroom and Cosmetics, Recipes and tagged homemade toothpaste recipe, natural toothpaste on September 4, 2016 by admin. As I am a vegan, I would not contemplate beeswax wraps. Any other ideas?